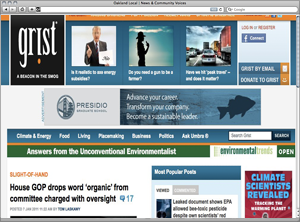 Irreverent online environmental magazine offers in-depth reporting with "secret sauce"
SEATTLE, WASHINGTON — Grist is an irreverent online environmental magazine that aggressively courts young readers, ad dollars, and philanthropic backers. Launched in 1999, the publication could be considered an octogenarian in web years, but maintains the tenor of a cheerful young rebel. To celebrate the nonprofit’s tenth anniversary, Grist founder and CEO Chip Giller announced a “Screw Earth Day!” campaign, saying “too many people tokenize Earth Day, using it as an excuse to hug a tree one day and ram it with their SUV the next.” The irony, hardly lost on Giller, is that Grist got its start with support from Denis Hayes, the environmental activist who coordinated the original Earth Day in 1970. Now Grist, with its trademarked tagline “Beacon in the Smog,” reaches about 800,000 individuals per month through its website, e-mails, and avid use of social media. The site was on pace to spend $3 million in 2010, about $500,000 of which comes from corporate ads and sponsorships, $300,000 from reader donations, and the balance from philanthropic foundations. “When we started, people were asking why we would do this, a nonprofit on this subject: ‘Are you smoking crack? '” Giller recalls. No longer. Grist has a full-time writing, editing, and web production team of fifteen, a steady flow of freelance contributions, and employs about ten others in marketing, ad sales, fundraising, and administration. The site features opinion, analysis, and in-depth reporting on major environmental issues of the day, mixed with lighter fare, including “advice on how to go green, the hottest pop culture and eco-tips for sustainable living.” Grist also hosts a popular question and answer column by Umbra Fisk (a recent entry: “What should we do about cats killing birds?“) as well as regular one-off features like this video of bird-watching novelist Jonathan Franzen playing a name-that-bird-game. Grist made its first big splash in 2001 with a takedown of The Skeptical Environmentalist–a controversial 1998 book by Danish author Bjorn Lomborg, who argued that many core concerns of the environmental movement, including deforestation, fossil fuel dependence, and overpopulation, were overblown. Grist solicited refutations from experts for a special issue. In both the 2004 and 2008 presidential elections, Grist grilled nearly all of the presidential candidates on their environmental views, and published what Giller called the “definitive interviews” on the subject. In 2006, Grist ran a seven-week series on poverty and the environment to show that developing countries and the poor are disproportionately affected by environmental problems, bucking the perception that environmentalism is a privileged preoccupation of wealthy white people. Grist’s efforts were recognized in 2005 and 2006 with People’s Voice Webby awards for best online magazine, which “put us on the map in the broader media sphere,” Giller says, and readership has grown steadily in recent years. “Geometric (growth) would be nice, but linear feels like you’re building a solid audience.” Half of Grist’s regular readers are in their twenties or thirties, says Giller, who is thirty-nine. Grist reaches beyond its regular readership through distribution agreements with SFGate.com, and as a member of the Guardian Environment Network. Alongside Mother Jones, Wired, Slate, and others, the publication is a partner in Climate Desk, an experiment in collaborative environmental journalism. Brett Norman is a reporter for Politico. Choose from the following categories to drill into the the News Startups Guide.